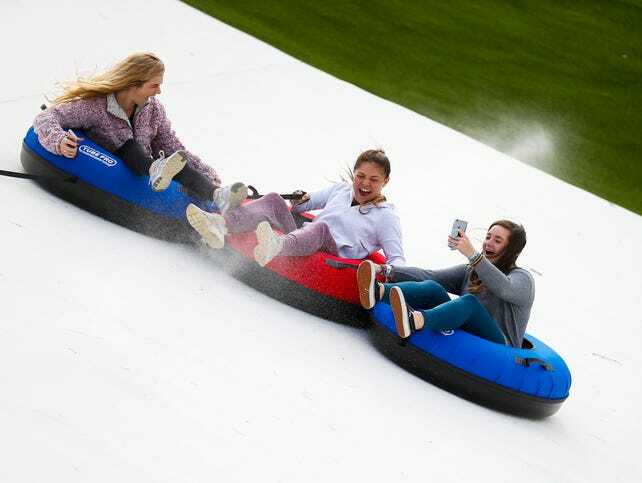 "We are excited to announce that we will be opening our brand new SnowFlex Park on December 1st and we’ve got some big ways to show it off! That Friday, starting at 6PM, the first 50 riders will get to ride for FREE and the first 150 will receive FREE chicken sandwiches from Chick-fil-A Branson! More special offers to come"
They've added quite a lot of stuff since they opened. BTW, you can see the snow patch from hwy 65, just gaze off to the east when you see the zipline. I think they may be taking selfies. SnowFlex was definitely in use when we drove by during the morning on 12/29. I drove by thursday morning about 11 am... Several people were lined up in their heavy coats and were riding away! !